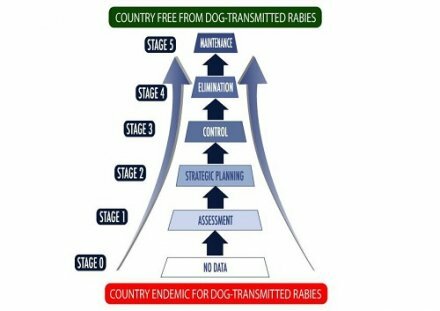 The Stepwise Approach towards Rabies Elimination (SARE) is a planning and evaluation tool to assist countries when developing national rabies programmes to control rabies and eventually eliminate dog transmitted rabies in their country. The tool has been developed upon request from dog rabies endemic countries. SARE is not prescriptive nor is it intended to replace existing regional or national rabies control strategies, but may serve as self-assessment tool and a practical guide to developing a stepwise approach towards rabies control and eventual elimination. The full SARE is presented in Section 6. Below is an overview of the Stepwise Approach towards Rabies Elimination. As Latin-American countries are reaching elimination of dog transmitted rabies, a multi-criteria decision analysis (MCDA) model has been developed by the Pan American Health Organization (PAHO). This tool helps the evaluation of rabies programmes across the region and to identify the best investment strategy for countries and territories to improve and efficiently maintain their rabies control efforts. previous page: 5.6.5. How well do dogs respond to vaccination?